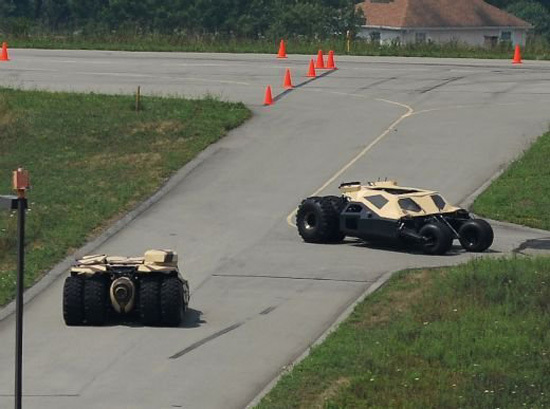 Three Different Bat-mobile Tumblers from 'THE DARK KNIGHT RISES' Debut in Latest Set Photos! Some more set photos from Christopher Nolan's The Dark Knight Rises have emerged. 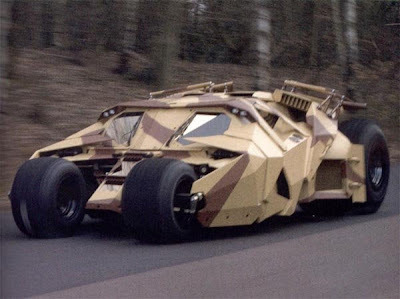 Back in the original movie, Batman Begins a scene that involved a prototype of the Batmobile aka Tumbler being brought to the batcave was deleted. Could these new images offer up a clue as to Batman's final wheels. Hit the jump for the details & images. Lucius Fox: "She was built as a bridging vehicle. 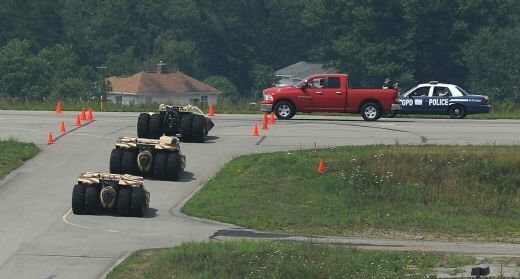 During combat, two of these would jump over a river, towing cables. Over here on the throttle, flip that open and throttle up. This will boost you into a rampless jump." Whats particularly interesting is that the Tumblers are distinctly different from each other. The images come via The Dark Knight Rises Rumors. I'm reading: Three Different Bat-mobile Tumblers from 'THE DARK KNIGHT RISES' Debut in Latest Set Photos!Tweet this!